Adding the ability to play music to any device seems to be more of a marketing bullet than the issue of technical difficulty. Even the GPS units now play MP3s. Soon microwave ovens will do the same while you wait for your lunch to heat up. I believe all those units will eventually converge as the electronics built into them becomes a commodity. The prices of (small and medium size) flat panels is sharply falling by day as the yields are improving and demand keeps growing by expanding into new markets and applications. (A little diversion: In my Linux Journal article on the voice-response, remote controlled MP3 player, I tried to combine technologies but it was too early for the elegance I wanted to have). 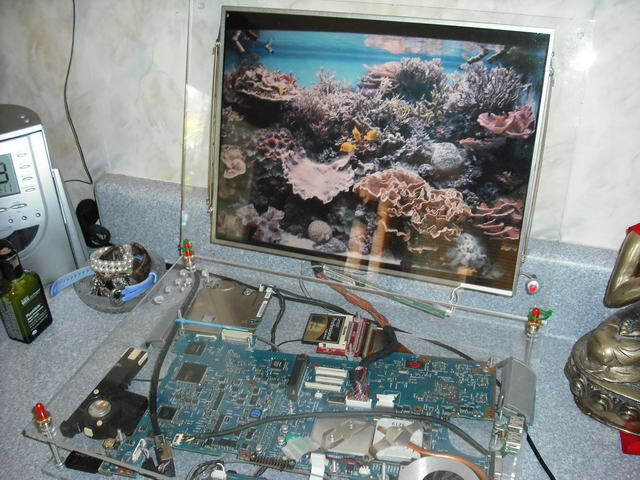 This time I wanted to see if a unit can be cheaply built with off-the shelf components that can do all of the things I wanted to have in a "kitchen radio/picture frame". This web page explains and demonstrates building such a unit from an old spare notebook. Picture Frame - Uses pictures shared by the home server and randomly displays them. Music Player - Build a playlist, select albums or titles to play and play them either randomly or in order. Internet Radio - Select to listen from the list of favorite radio stations from my own database of over 6,000 stations from all over the world. Local weather - With the temperatures in Austin, Texas exceeding 105 this Summer, this is a valuable information. Local Allergy - Yeah, allergies are bad in Austin. Display the graph of current and forecast allergies. I custom-wrote the client program since that's the only way I could have it exactly the way I needed it to be and also have it extensible for future needs. 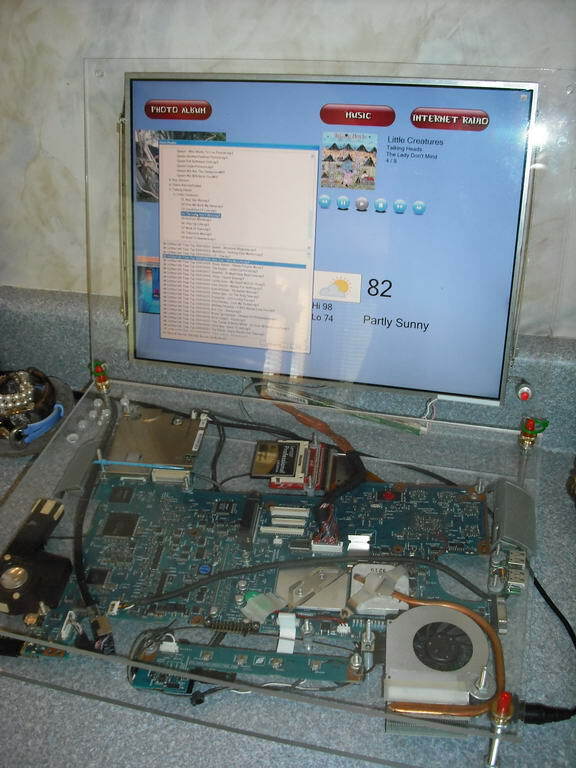 I was familiar with various models of older notebooks, so I found a unit on Ebay whose seller listed it as having a rattling noise inside and trying to boot, but not being able to, so it was really not functional for him. That laptop had some other problems and missing things which again did not concern me, and for $75 it was a perfect bargain. 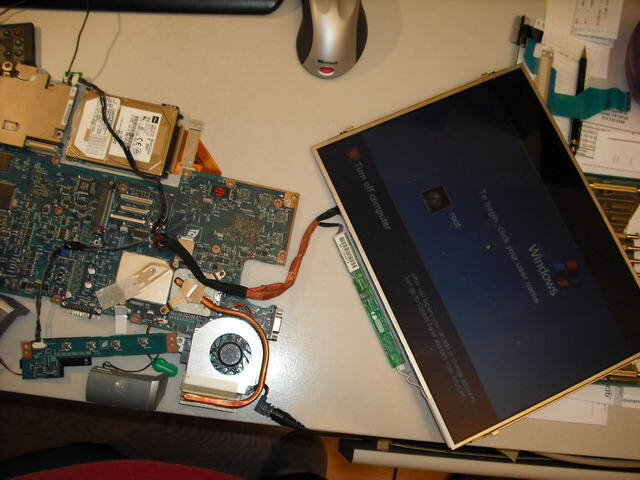 I also purchased a wireless card for that notebook which I ended up not using since the resume from suspend kept taking long time to reconnect causing network problems. I ended up simply plugging in a network cable. The other "large" expense was a Compact Flash drive ($45, 4Gb Crucial Lexar UDMA 300x CF) and the IDE to CF interface card for it ($35). 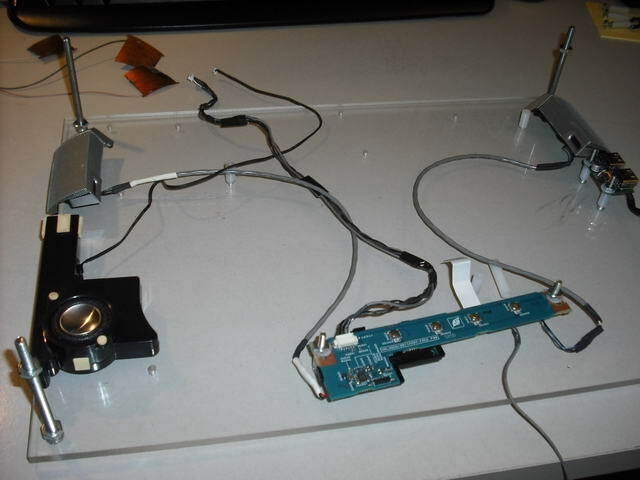 I wanted a silent, low-power solution and a fast CF card with UDMA. The rest of expenses was miscellaneous hardware from Home Depot and Lowes, totaling about $30. 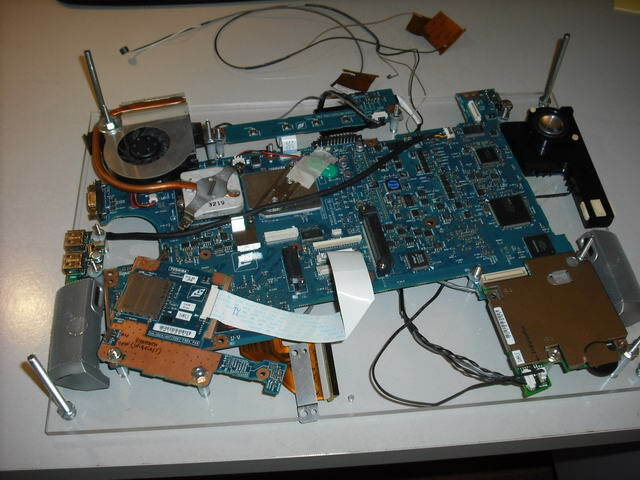 These images show gutting the notebook apart and taking only the pieces that are useful to the frame unit: motherboard, sound module and speakers, LVDS screen, memories. Still, I had to hand cut some spacers to custom-fit some of the components which mounted on top of each other and were not even with the rest. 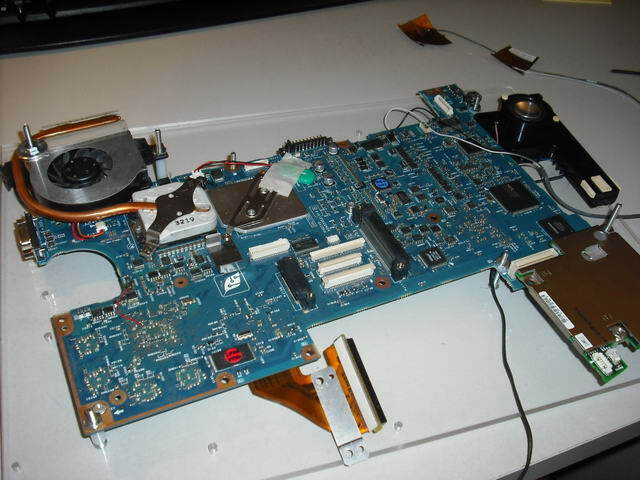 Here is a mounted motherboard, with the sound module on the right, subwoofer at the top and the CPU fan on the top-left. Sticking out are the wires for the wireless network whose receiving pads normally get glued to the back of the panel. This corner contains the sound module with the volume control. I did not want to clutter the software interface with the sound volume - I wanted to use the physical volume control, so I positioned it to stick out from the back of the frame. I was about to set the sound level to around 80% in software and let the volume dial do the volume control. Conveniently, there are also jacks for the line-in, line-out located right next to it, which I did not plan on using right now, but they may come in handy in some future application. I needed USB connectors right off the side of the unit so that I can plug in wireless mouse and possibly other peripherals. Initially, I needed to use the external keyboard until everything is set up. In the future, I could add the support of getting images from an USB drive or something like that. Keeps options open. These are pretty much all components mounted - it ended up a bit crowded. Here is it again making sure that it all works while setting up. It does look busy, but this is actually the bottom of the frame; it's turned upside down and around for the final assembly. It still has a hard disk plugged in. There was much tweaking involved, but in the nutshell, once all the drivers were installed, I configured and installed the software, and then made the image and copied it onto the Compact Flash card. Mounting the panel was a challenge. First I tried using the double edge tape around the edges. It did not stick strong enough and suddenly the panel would just fall down when set upright. Then I noticed the tiny metal brackets on the sides of the panel. They did not have any holes in them and I believe they were used to hold the panel firmly by the plastic enclosure. 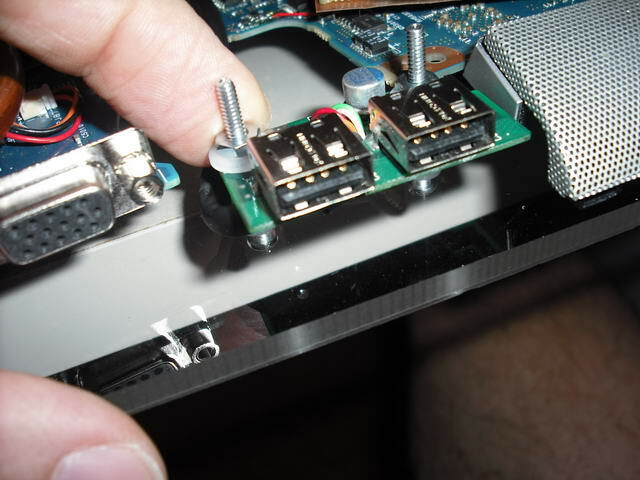 I drilled very small holes on the acrylic, and then used tiny screws right in between the panel and the brackets, screwing it into the Plexiglas. It worked! The assembly now seemed to be very strong. 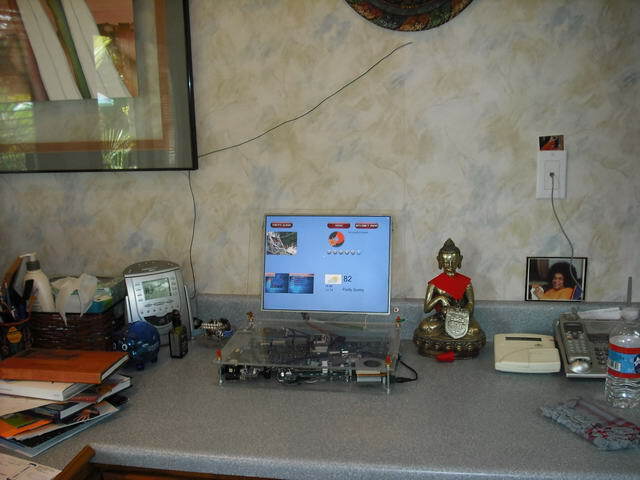 This image shows the final unit sitting on our kitchen counter. I decided on using XP since I could quite easily write my application in C#, and I know the power management drivers are supplied by the vendor. I used XP Lite to trim down the OS to bare minimun, stripping down components in order to comfortably fit them onto a 4Gb flash card. The other reason for heavy trimming was to get rid of all unnecessary services and drivers (and XP comes with a lot of that!). This will make a new copy of the OS bootable. Since I have a server running 24/7 in my house, I did not care keeping any of the media on this machine, since everything was already on the server (music, pictures). As it's designed now, one piece of software runs on the server (I call it "indexer") and scans the media files creating XML index file which I share through a shared folder. The Frame software itself reads all the XML files and the media files they point to as they are needed. For the music and radio, you can create playlists by dragging and dropping albums or clusters of items. Since there is no keyboard, I put special attention to the ease of the UI and I believe I have succeeded since my wife could use it without much training 🙂 The GUI UI ended up simple and very intuitive, and yet it does everything it was supposed to do. I have a list of about 6000 radio stations from all over the world. It is hard to collect such list, and indeed I could not find it anywhere on the Internet (for free, that is). So, I wrote a set of Perl scripts that harvest some of the best internet radio portals. The scripts would issue HTTP requests and then parse the result, stashing away information such as: different URLs to the stream, optional logo picture of a station, name and description, genre. Some of the portals were easy to do: they listed stations by their ID which I would simply query from 1 to 10000 or so. I had those scripts running for weeks from the server, 24/7 and collected the results. Some portals stopped talking to me when they figured out I was harvesting their data etc. but at the end I got a very nice list. I wrote some other scripts/software that would work on that data and create a master XML list of stations for the Frame to use. I already mentioned a digital clock which kicks in if you are not displaying images full screen. I found a free one here and installed it as a screen saver. Then I added some C# code to control it since only the application knew when it is all right for it to kick in. For creating images from the text, this site was extremely useful. I used it to create those big buttons. Format the storage (Compact Flash in this case) with the FAT32 file system, not NTFS! The latter one does random disk accesses to various hidden and virtual files such is C:\$tmp as part of the complex file system house keeping. There is no way to turn this off and, while it can be minimized, it still unnecessarily taxes the CF card. Have a secondary solution for the networking. It turned out the wireless takes really long time to reconnect after a resume (which may be due to this specific system/card?) I ended up waiting for the wireless card for almost a month from an eBay purchase and at the end not using it but simply connecting to a network cable; it runs along the power cable, so it's not that bad. Do more real-world tests with the system before committing to it. I wanted to have a vertical-standing picture-frame looking system. 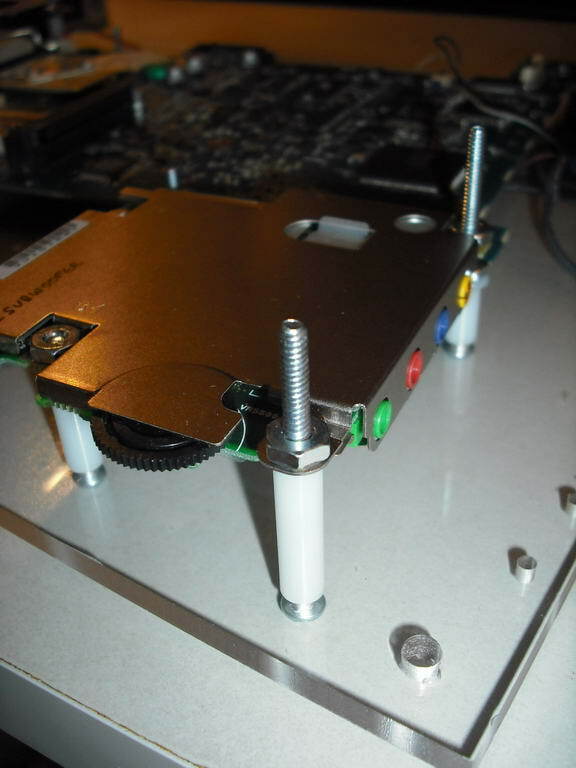 Well, the thermal cooling on that motherboard would simply not do the job when mounted vertically! The CPU temperature would not dissipate and the fan kept working at the full speed (the cooling rig was even too hot to the touch!) When placed horizontally, the cooling worked fine. 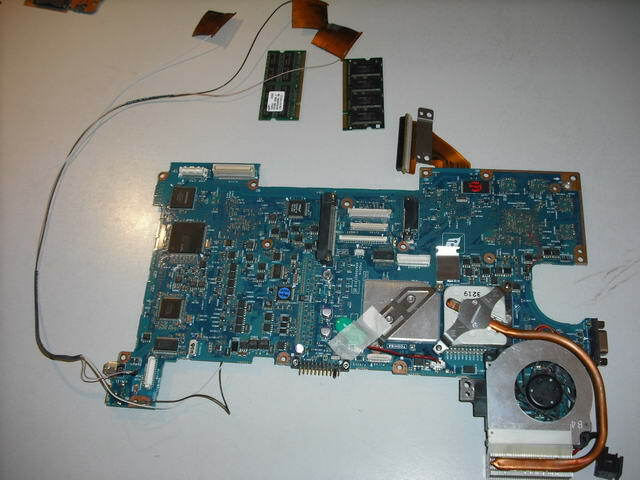 I had to make a last-minute design change to lay the whole thing horizontally, and only mount the LVDS panel vertically. 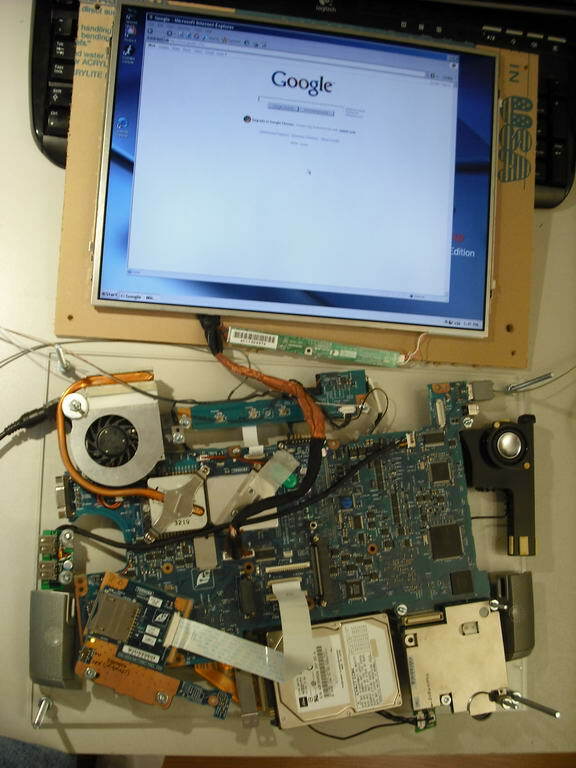 So now, it does look like an laptop it started with, but at least it is not thermally compromised. 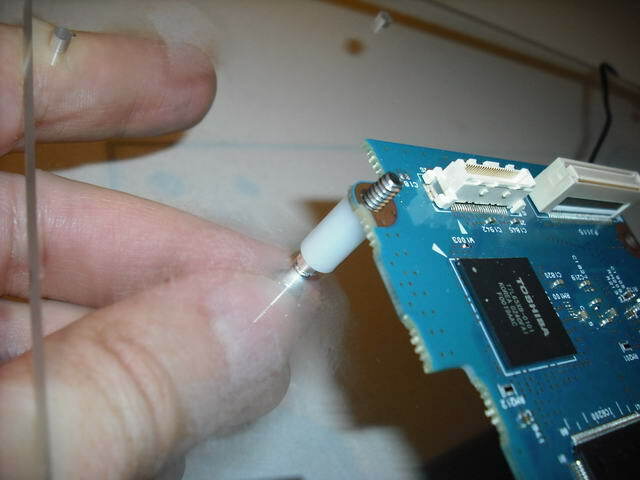 Use screws, not glue or tape. 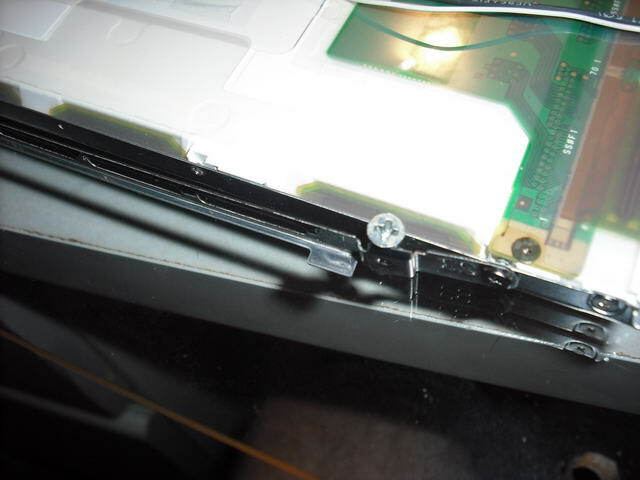 Originally I meant to use a double-sticky tape to tape the LVDS panel to the acrylic giving it a clean look. That worked. Well, for two days, at least; the panel went down as the tape simply detached. Ended up using small screws jammed between the outer edges of a panel and slim panel metal brackets that just happen to be there. The screws are very short so they don't poke out from the front face of the acrylic and the mount is very tight and firm. I am very happy how that one turned out. Touch screen would add up a cost and it would be difficult to find one that is as large as this panel anyways. Wireless mouse purchased at Fry's for $14 worked as fine. Tuck it away when not in use. Just when you think everything is setup nicely and there are no unnecessary disk accesses to ruin your CF card in the long run, there is something causing the machine to stutter or occasionally (but regularly) access the drive. (The CF to IDE adapter I bought has a little LED showing the access.) Perhaps a poorly written system control from a notebook vendor that you really don't need (a Fn-key handler while you don't have a keyboard or something like that). 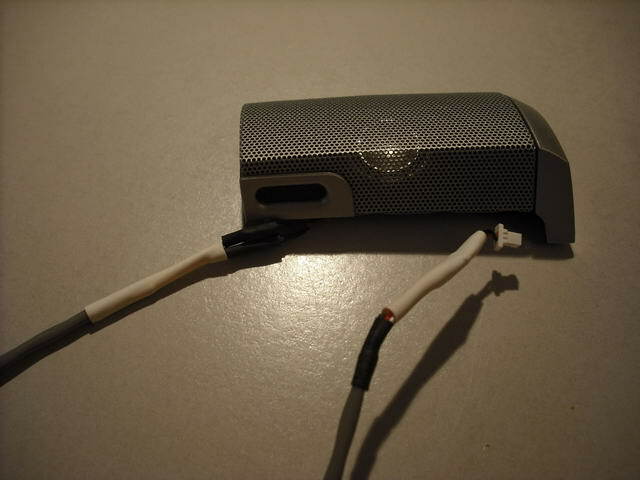 FileMon will tell you who is still not cooperating and you can remove the driver or a component. It's never completely done! The software will show bugs once in a while; friends will give comments which you want to address or they will have a cool suggestion and you will want to implement it. More importantly, while using it on a daily basis there will be subtle things you wish it would do, so you'd go ahead and implement them. Run the .NET application on a HDD the very first time for .NET to compile it. Also I've found out there are few other things that the XP wants to do in the background on a new system, so let it do all of it on a HDD, not on the CF card due to limited number of writes that the compact flash can perform in the long run. Having a CPU/GPU fan is not that bad as some DIY postings state. If you set the power management right, the fan rarely turns on. The software I am running is not that CPU intensive. The main problem was to find that performance balance between the Intel SpeedStep and the OEM custom power management tools. I love having an UDMA (300x) CF card instead as a notebook drive: boot times are extremely fast and there is that zapping silence while accessing the drive. I compared the performance and the random access time of 0.4 ms is mindboggling (compared to ~16ms for the platter drive). The average read/write profile is flat at 41 Mb/s for all the sectors. My notebook drive peaks at 35 Mb/s for outer tracks and then slows down to half that value as less information could be stored on the inner tracks. The unit can still be improved, but at this point it does what it was created to do; and it does it well. If I were to do it again, I would try to make it slimmer in order to put it on the wall. I would also probably just go ahead and purchase a touch screen. These screens can be mounted in front of the panel - they come with an USB interface and from the software perspective fully mimic the mouse. Or perhaps by that time some vendor will figure out there is a market out there for such devices and will make one for a reasonable price. Comments or suggestions? You can email me at "gdevic @ yahoo.com"